A wide variety of insulators are available, but virtually all consist of an insulated wire retention part and a fixing system. In the case of a permanent fence, the wire retention part may be captive, in that the wire is threaded through the retainer during the construction of the fence and cannot be removed. This ensures that the conductor wire remains within the insulator. Alternatively where a temporary or semi-permanent fence is required the retainer may be of a quick release type to allow quick construction or removal of the fence. These do not offer the same level of retention as the captive insulators. The nature of the fixing system will be dependent upon the posts used in the fence construction. If box section or angle iron posts are used, threaded bar and nuts will be used to hold the isolator in place. 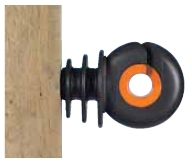 Timber posts are generally suited to a screw in or a nail on insulator. In the case of temporary fence posts clip on or wind on insulators are available or the insulators may be an integral part of the post. 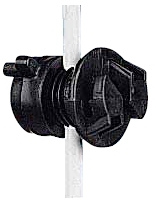 Various insulators are available for all sorts of conductors. The XDI ringinsulator is a revolutionary new version of the standard ring insulator with a metal core using a new technology (patent pending). The W insulator is the strongest in the world. It features a 10-year product guarantee and is made of the very best materials. There is a broad range of tape insulators for the PowerLine and Turboline tapes. Polywire, tape and rope are available in various colours and lengths. Gallagher recommends to use a PowerLine conductor for fences up to 500mm. Made of durable material and a mix of stainless steel conductors. These are used to improve and secure the life span and operation of existing, even non-electric fences. Easy to install: the insulators fi t into netting or post and rail fences. All Gallagher electric fencing insulators are available from www.wildlifefencing.co.uk as well as all other Gallagher electric fencing products.